14.01.2008 - Before the match Slagelse were sure to proceed to the main round from second position in the group – without being able to reach the first place - while Ribarroja were just as sure to finish last in the group. Therefore only the pride was at stake in Antvorskovhallen in Slagelse Saturday afternoon. 07.01.2008 - Podravka Vegeta defeat Ribarroja by 26:38. The Croatians secure third place while the Spanish team suffer their fifth consecutive CL defeat. 04.01.2008 - Cementos La Union Ribarroja and Podravka Vegeta will decide on Saturday who will reach third place of Group A. 20.11.2007 - Győri ETO won all their matches so far in the CL. 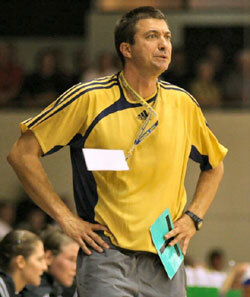 Coach Csaba Konkoly is not worried about the upcoming break and hopes that his players will return after a successful World Championship.